After confirming the model’s development in September last year, Aston Martin has revealed the first design concept of its next hypercar. 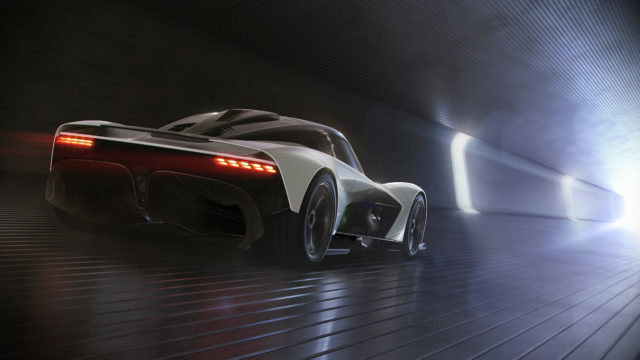 Previously dubbed the Project 003, the concept is now called the AM-RB 003 – solidifying the involvement of Red Bull Advanced Technologies in the development of the latest mid-engined models from Gaydon. The 003 follows on from the Valkyrie and Valkyrie AMR Pro, and, like the previous two mid-engined models, it will feature F1-inspired technology and design processes – with the Red Bull team focusing on getting the most out of the chassis and aerodynamic setup. Under the incredibly sleek shell will sit Aston’s first V6 turbo hybrid – like you would find in a current Formula One car – and it isn’t out of the question that the car will come with F1-like performance as well. This engine is also very important, as it will be built and designed in-house by Aston Martin itself. Aston Martin’s director of design, Miles Nurnberger, said: “We were quite deliberate in AM-RB 003 to not disguise its lineage, but we were equally emphatic that it would be a distillation of Aston Martin Valkyrie and not a dilution. Following on from the tightly-packaged Valkyrie, the 003 comes with a slightly wider and more accommodating cabin – with the rectangular steering wheel and instrument display are mounted on the same steering column. The infotainment system is also set to be smartphone-based, with the driver’s device mounted on the dash on its own holder. Aston Martin Lagonda president and chief executive officer, Andy Palmer, said: “When Aston Martin secured the services of Red Bull Advanced Technologies to embark on the extraordinary journey that became Aston Martin Valkyrie and Aston Martin Valkyrie AMR Pro, it was always my hope that it would lead to a long-term collaboration. “As these projects enter an incredibly exciting phase with the commissioning of the first running development prototypes, it gives me tremendous satisfaction to confirm that this exceptional partnership is continuing with the AM-RB 003 – a hypercar that not only draws from the ethos and DNA of Aston Martin Valkyrie, but will in turn influence Aston Martin’s first series production mid-engined supercar”. Only 500 of the 003 will be built, with the car going on sale at the latter end of 2021.